27th match of 2015 ICC Worldcup has been played between Bangladesh and Scotland at Saxton Oval, Nelson today. Following the huge teaget of 319 runs Bangladesh successfully chased record target and upset Ireland by 4 wickets with 11 balls remaining. 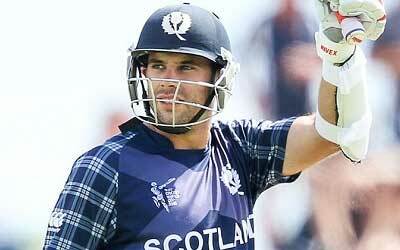 KJ Coetzer (Scotland) made 156 runs and declared man of the match for his splendid inning. Earlier, Bangladesh won the toss and opted to field first. Scotland lost two wickets early on 38 runs but, KJ Coetzer and MW Machan played good cricket and played useful innings for Scotland. KJ Coetzer made superb 156 runs with sensible cricket. other middle orders also performed well and put Scorland on huge score of 318 runs at the end of 50 overs. Following huge target of 319 runs, Bangladesh lost Soumya Sarkar early on 5 runs. But, Tamim Iqbal and Mahmudullah took charge in hand and played superb innings for Bangladesh. Both added 139 runs for 2nd wicket and put Bangladesh on front foot. Tamim Iqbal made very good 95 runs and Mahmudullah contributed 62 runs of 62 balls as well. Middle orders also played quick cricket. Mushfiqur Rahim 60 runs of 42 balls. Shakib Al Hasan 52* runs of 41 balls and Sabbir Rahman 42 runs of 40 balls gave Bangladesh comprehensive win over Scotland by 4 wickets.